A common misconception about the writings of J.R.R. Tolkien often used by critics within the genre is that his work offers “reassurances,” a bucolic and cozy English country professor’s view of the world using those adorable Hobbits. Where this view comes from, I have no idea: Tolkien’s world drips with deepest pessimism taken directly from the Anglo-Saxon and Scandinavian literature he so loved. The Lord of the Rings tells the epic of the “Long Defeat”: even in victory much that is beautiful must pass away, and the hero is “too deeply hurt” to enjoy the bucolic isolationism that his sacrifice purchases for his people. Hope lives, but not for those who fight to preserve it. 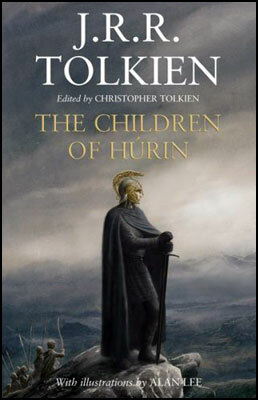 Perhaps the publication as a stand-alone work of The Children of Húrin will open more readers’ eyes to the grim Northlands conception of fate that dominates Tolkien’s writing. Since the posthumous release of The Silmarillion, Tolkien’s son Christopher has spent thirty years publishing scholarly volumes analyzing the textual complexity behind the legends of the Elder Days. Many fantasy readers have strangely drawn away from The Silmarillion, finding it dense and incomprehensible. I have always considered this a minor tragedy, for The Silmarillion is one of modern literature’s most astonishing acts of imagination. Its unfiltered epic voice speaks with emotive power that few other authors could hope to achieve in those mammoth sextologies that keep weighing down bookstore shelves. There is nothing like the book, and never will be again. What then is this ‘new’ book, The Children of Húrin? Tolkien conceived The Silmarillion as an overview of the First Age of Middle-earth, containing within it individual stories that merited expanded tellings, much the same way that The Iliad is one story within the larger framework of the Trojan War. For most of his life, Tolkien worked fitfully on three major stories within the longer sequence of the Elder Days: the fairy tale-inspired “Beren and LÃƒÂºthien,” the last-stand battle epic “The Fall of Gondolin,” and the tragedy of fate “The Tale of the Children of Húrin.” In the appendices to the new book, Christopher Tolkien explains that the latter story “in its latest form is the chief narrative fiction of Middle-earth after the conclusion of The Lord of the Rings…. For this reason I have attempted in this book, after long study of the manuscripts, to form a text that provides a continuous narrative from start to finish, without the introduction of any elements that are not authentic in conception.” Unlike his scholarly annotated approach in the History of Middle-earth series, the younger Tolkien refrains from footnotes and textual interruptions, providing only an introduction and appendices to explain the composition of the full tale from his father’s manuscripts. Alan Lee, the current artist most closely associated with Tolkien, provides fourteen new color plates and many line illustrations for the book His dreamlike watercolors fit the story ideally, far better than Ted Nasmith’s disappointing work on The Silmarillion, which lacked the mists of myth that Lee provides here. The painting of Glaurung ruining Brethil in a deluge of fire that turns even the mighty dragon into a squiggle among the flames is one of the artist’s finest pieces of work. An astounding tale and a handsome volume… but will readers unfamiliar with The Silmarillion be able to enjoy a work originally embedded in it? Christopher Tolkien provides an introduction to give newcomers a context to the complexity of events preceding TÃƒÂºrin’s story, but this makes for bewildering reading all on its own. New readers will find the opening chapters a daunting phalanx of people and places and should keep a bookmark on the index of characters in the back pages because they will need to look up names in a flurry. However, as the narrative escalates and the strands of fate tighten, few readers will have trouble following events. The simplest solution, however, is to read The Silmarillion first. Your local bookstore has it. A friend will let you borrow it. I’ve got extra copies, I’ll loan you one. Please read it. Then read The Children of Húrin. Although it encompasses work many decades old, this publication will stand as one of the best fantasy novels of 2007. Imaro has returned. To those in the know that information can only be greeted with pleasure. To those who enjoy a good sword-and-sorcery romp but who missed out on Imaro the first time, you’re overdue for a look at one of the most unique heroic fiction characters from the 1970s and ’80s. 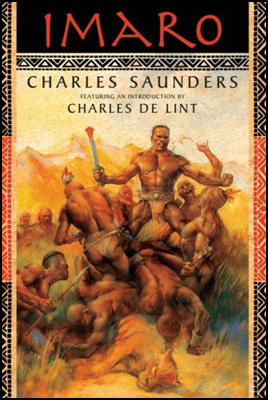 Imaro is the creation of Charles Saunders, who placed his character in a fantastic Africa, Nyumbani. The stories breathe with atmosphere, so much so that the setting is a character unto itself. The customs, people, and places feel real. While the supernatural and fantastic stalk this world, Saunders’ storytelling skills present even the ordinary features of his setting, from savanna to jungle, as something vivid and new. Tie in Saunders’ skilful world-building with his taut action and suspense scenes and you have an explosive mix, one that Lin Carter was quick to recognize, printing Imaro tales in several books of The Year’s Best Fantasy and Horror series when Carter helmed it in the ’70s. DAW books quickly came calling after the first Imaro stories appeared, and three Imaro novels followed. That, though, is where things went wrong. A series of publishing missteps and poor promotion left the series floundering. Imaro disappeared and shortly thereafter so did Saunders, at least from the fiction field. Now, a little over twenty years later, Night Shade Press has reprinted the first Imaro novel in a handsome trade paperback, with more novels slated to follow, including new material still underway from Saunders. When he first appeared Imaro was compared more to Conan than to any other sword-and-sorcery or adventure character. True, both Conan and Imaro are wandering adventurers, and Saunders is one of the few sword-and-sorcery writers with action chops in Robert E. Howard’s league, but to my mind Imaro is more like Hercules than Conan, striding the land doing mighty deeds, aided both by his titanic strength and his cleverness. There is a mark of destiny and doom about him, but not in the Wagnerian sense we find in Moorcock, whose Elric was striding MelnibonÃƒÂ© at the same time Imaro walked Nyumbani. The Conan stories as conceived by Robert E. Howard were episodes from his life told in no particular order, despite their frequent reordering in collections: Imaro’s tales are presented in chronological sequence. We experience his early days with him and as a result understand his passions and his demons. Born the son of mixed parentage in a warrior society, Imaro longs always for the acceptance of his people, although when he finally earns it his own pride sets him on another path. A mighty warrior, at heart Imaro is a decent, loving man who hides behind a wall of stoicism he’s built both to protect himself during his troubled upbringing and to endure the horrors he’s faced in after years. Most other sword-and-sorcery are rogues born with wanderlust. They’re fascinating to see in action but aren’t necessarily people we’d care to meet. Imaro, however, I have always found honestly likable. This new edition has an added treat — an entirely new section was devised by Saunders to replace a portion of the original novel that had uncannily foreshadowed some of the horrors we saw in the 1990s when Hutu extremists massacred upwards of 800,000 Tutsi’s and Hutu moderates. Imaro shines even more brightly in this new segment than he did in the original. If there’s a flaw to be found here it’s that the love of Imaro’s life, Tanisha, falls into Imaro’s arms a little too simply; a strange criticism perhaps, in an adventure novel, and it probably speaks to Saunders’ skill with characters and motivations in all other portions of his narrative. Saunders’ tales have languished too long in out-of-print paperbacks or in hard-to-find small press magazines. This reviewer hopes that renewed interest in Saunders’ works will finally see all of his stories between cook covers. Recognition for Saunders’ contributions to heroic fiction are long overdue, as is Imaro’s return.